The Motorcycle Accident Lawyers at Tenn And Tenn, P.A. 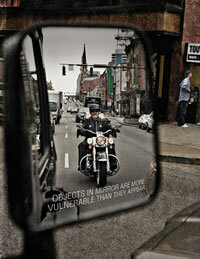 in Manchester, New Hampshire take this opportunity to remind everyone that May is Motorcycle Safety Awareness Month. The month of May has been recognized nationally as Motorcycle Safety Awareness Month, in conjunction with the start of the motorcycle riding season. To encourage motorists and motorcyclists alike to “share the road.” Motorist awareness is a fundamental goal of The National Highway Traffic Safety Administration. Motorcycles have the same rights and privileges as any motor vehicle on the roadway. The NHTSA reminds all motorists to safely “share the road” with motorcycles and to be extra alert to help keep motorcyclists safe. As motorcycle accident lawyers, we see first hand the tragic results of motorcycle accidents and collisions and the injuries sustained to motorcyclists. Each year, motorcycle accidents cause severe injury and claim the lives of many New Hampshire and Massachusetts residents. Unfortunately, many of these motorcycle collisions are caused by inattentive drivers who fail to see motorcyclists. The President of the American Motorcycle Association recently stated that motorists are conditioned to be on the lookout for other cars, trucks, buses, and pedestrians. Unfortunately, many motorists forget to look out for motorcyclists with whom they share the road. Drivers can help motorcyclists remain safe on the roads by allowing them extra space and not following too closely. The AMA President also said that motorcyclists need to do their part to ride safely by wearing protective equipment including gloves, proper footwear, and a U.S. Department of Transportation approved motorcycle helmet. New Hampshire offers motorcycle rider training programs to help all motorcyclists not only learn motorcycle safety but to sharpen their skills while riding. The motorcycle accident lawyers at Tenn And Tenn, P.A. encourage our fellow motorcyclists to always practice defensive driving, never to use alcohol or drugs while operating a motorcycle, and to be certain their motorcycle is in good working condition. We have helped many New Hampshire and Massachusetts families recover the compensation they need following a motorcycle collision. Our motorcycle accident lawyers are experienced riders themselves and understand the needs and concerns of families who are dealing with a loved one who has been injured in a motorcycle crash. We are here to help and can be reached on our free injury helpline at 1(888) 511-1010.